Hundreds of hoteliers joined us in New York today for the return of the Direct Booking Summit, and there was one clear message — hospitality begins online. Triptease’s Chief Tease Charlie Osmond kicked off the event — the only one in the industry to focus solely on increasing direct bookings — by explaining why he believes bringing the magic of your hotel lobby onto your website is the next chapter in the Direct Booking Movement. Other highlights from the day included a staggering stat courtesy of McKinsey's Del Ross. He told delegates he had received 23 emails from the Expedia company alone over the last 30 days. OTAs are marketing to your customers constantly and he encouraged hotels to get a piece of the action. Ross also predicted that voice-based search could be the way Amazon breaks into the travel market. It might be a way off yet — voice technology still needs refining — but it's certainly something to have on your radar. Another hot topic was education. Many of our hotelier speakers said they are still putting a lot of effort into explaining the benefits of booking direct to both staff and guests. 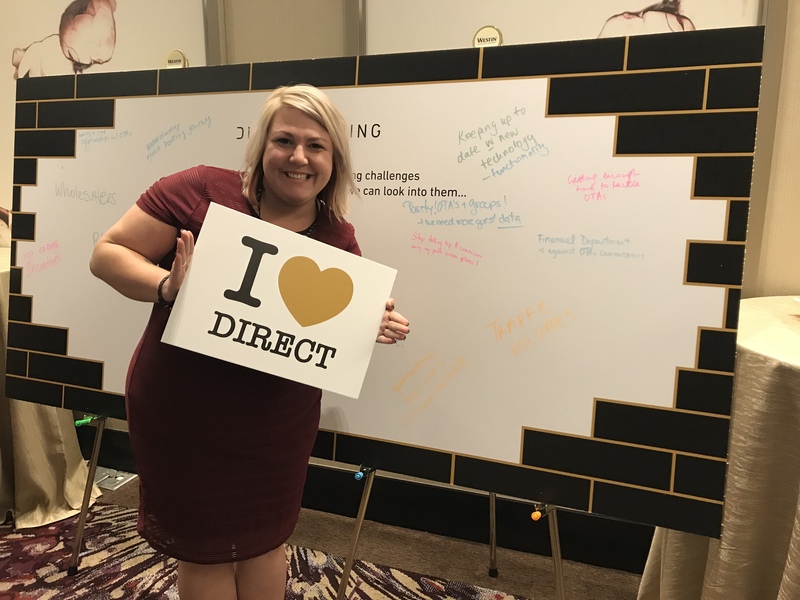 Emily Patrician, General Manager at Mere Hotel, Winnipeg, said she regularly tests whether her training is paying off by having a friend call her hotel to explain they found a better deal via an OTA. After all that, we think our speakers and delegates deserve to let their hair down, so we’re throwing a fabulous penthouse party for them in the heart of Manhattan. There will be epic skyline views, games and dancing into the small hours. We’ll have more from the party tomorrow, as well as a full round-up of the second day of events. We’re starting with a delve into digital with Kalibri Labs, before uncovering the small changes that could make a big difference to your revenue. Lastly, Charlie Osmond will be back with more on where the Direct Booking Movement is going next. If you like the sound of the Direct Booking Summit, then your luck is in — there is still time to book your ticket for its sister event in Barcelona on October 18th and 19th. Check out the agenda or register below.